Police in San Francisco have arrested 1,025 people during violence at an anti-war demonstration. Protesters blocked streets leading from the city's Oakland Bay Bridge, while small groups of people clashed with police and threw debris. Tens of thousands of people joined demonstrations across the US. There were huge protests across the world on Thursday, with violence in several countries including Belgium, Egypt, Spain, India and Switzerland. I've never been more disgusted or ashamed to be an American. "This is no ordinary day," said Jason Mark, a protester in San Francisco. "America is different today. "We've just launched an unprovoked, unjust war." Anti-war demonstrators in New York completely blocked New York's Broadway for two blocks below 42nd Street, while hundreds of protesters gathered in Washington and at university campuses around the country. Hundreds of students at Harvard University walked out of classes at noon, and at least 1,500 people took part in a rally. Some of the biggest outbursts of opposition to the war have been in Europe. In Brussels, police used water cannon and tear gas to disperse hundreds of protesters who were throwing stones outside the US embassy. Organisers said 3,000 people joined the protest, though police put the figure at 1,500. Egyptian riot police used water canon and batons to beat back crowds throwing rocks and trying to advance on the US embassy in Cairo. "We just wanted to tell the Americans they are no longer welcome here," said student leader Fadlallah Abu Wafia. Protesters unfurled banners reading "Shame on USA" and "Vive la France, Arab governments go to hell". Much of the anger was directed against Arab leaders for not opposing the US action. In the Syrian capital, Damascus, demonstrators waved Iraqi flags and denounced US President George W Bush as a war criminal. Crowds tried to advance on the US embassy before being forced back. They also marched on the Egyptian embassy, and the embassy of Qatar - the host of the US Central Command for the duration of the war. "This war, it's like throwing food into the sea. It's a waste." Police in the Jordanian capital Amman used force to break up an anti-war march by lawyers belonging to the Jordanian Bar Association. At least four of the lawyers were injured, needing hospital treatment. Turkish protesters marched through central Ankara, where the parliament has voted to allow US planes to use Turkish airspace for the war on Iraq. At least 100,000 people marched through the Greek capital, Athens, many of them school pupils. "We left class and asked our professors to join us," said Lefteris Faniotakis, a 15-year old student heading a group of 100 schoolmates. Tens of thousands of school and university students in Italy staged spontaneous rallies in towns and cities all over the country. Swiss police used tear gas against hundreds of protesters, also mainly students, who marched on the US diplomatic mission in Geneva. Spanish police fired rubber bullets at protesters in Madrid. 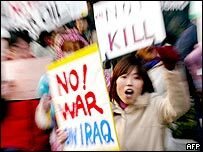 The demonstration, protesting against the government's support for the war, included well-known actors and celebrities. Eggs were thrown at the British consulate in Venice and police used teargas to disperse demonstrators. More students staged a sit-in outside Nato headquarters in Naples. Germany, France and Britain also saw big demonstrations, many involving schoolchildren. There have also been widespread protests in Asia. There was violence in Calcutta, in eastern India, when about 1,000 protesters tried to storm a US cultural centre. At least 12 police officers and six protesters were injured, a senior police official told Reuters news agency. In Indonesia, 2,000 people took part in a march in Jakarta in support of the government's call for an end to the war. 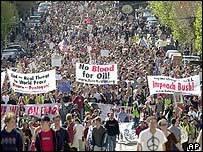 And many anti-war demonstrations have been held in Australia - which has committed warships, aircraft and 2,000 troops to the conflict. "The signal for war was also the signal for worldwide anti-war demonstrations"